Protect yourself against hazards and accidents in the workplace with our always-updating selection of safety footwear for any environment. We offer a full range of styles including Non-Protective Toe, Static Dissipative, and for those jobs that require protective toes we offer Steel Toe, Composite Toe and also Metatarsal Guard. For the unpredictable elements, shop our Waterproof Boots and Insulated Boots. We offer a full range of safety footwear styles including Non-Protective Toe, Static Dissipative, and for those jobs that require protective toes we offer Steel Toe, Composite Toe and also Metatarsal Guard. For the unpredictable elements, shop our Waterproof Boots and Insulated Boots. 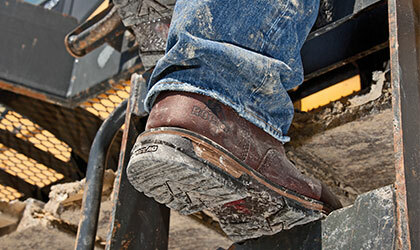 Looking for exceptional deals on your work boots and shoes? Choose from the Lehigh Power Buys today!